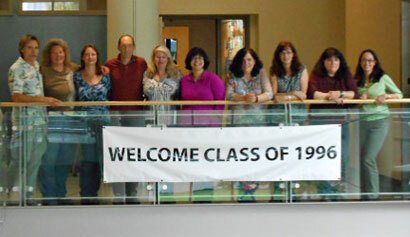 The Class of 1996 gathered in Magruder Hall last week for their 20 year reunion. Thirteen alums and their families joined Drs. Tornquist, Riebold, Parker, Huber, and Whitler for brunch. None of the attendees had toured Magruder since the addition of small animal hospital facilities in 2005, and were surprised by how much everything had changed.